I am trying to highlight exactly what changed between two dataframes. 113  Zoe    4.12                     was True | now False was "" | now   "On   vacation"
I suppose I could do a row by row and column by column comparison, but is there an easier way? Here the first entry is the index and the second the columns which has been changed. * Note: it's important that df1 and df2 share the same index here. To overcome this ambiguity, you can ensure you only look at the shared labels using df1.index & df2.index, but I think I'll leave that as an exercise. It is possible to use the DataFrame style property to highlight the background color of the cells where there is a difference. Now, its much easier to spot the differences in the frames. But, we can go further and use the style property to highlight the cells that are different. We define a custom function to do this which you can see in this part of the documentation. This will highlight cells that both have missing values. You can either fill them or provide extra logic so that they don't get highlighted. This answer simply extends @Andy Hayden's, making it resilient to when numeric fields are nan, and wrapping it up into a function. """Identify differences between two pandas DataFrames"""
"DataFrame column names are different"
"Data Types are different, trying to convert"
111  Jack   2.17                     True                 "He was late to class"
112  Nick   1.11                     False                "Graduated"
113  Zoe    NaN                     True                  " "
112  Nick   1.21                     False                "Graduated"
If your two dataframes have the same ids in them, then finding out what changed is actually pretty easy. Just doing frame1 != frame2 will give you a boolean DataFrame where each True is data that has changed. From that, you could easily get the index of each changed row by doing changedids = frame1.index[np.any(frame1 != frame2,axis=1)]. After fiddling around with @journois's answer, I was able to get it to work using MultiIndex instead of Panel due to Panel's deprication. Not the answer you're looking for? 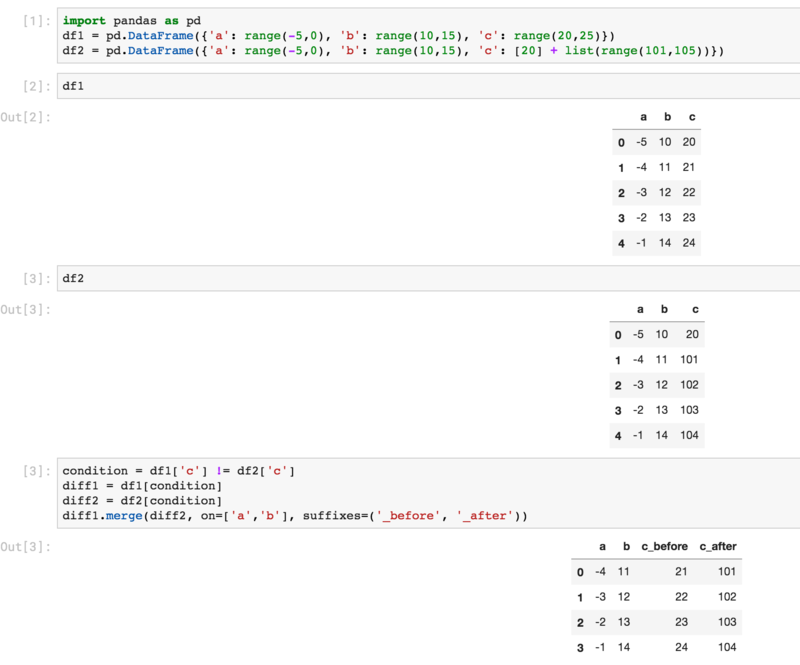 Browse other questions tagged python html pandas dataframe panel or ask your own question.